We’ve all heard to not eat before a workout. But if you are trying to build muscle and lose fat, you need energy. It is almost essential that you eat some kind of snack before exercising. It might sound crazy but, according to the Biggest Loser personal trainer Jillian Michaels, not eating before a workout is a myth. “Your body needs a certain amount of sugar for fuel when training. When that blood sugar is not there, your body will convert your own muscle tissue into energy,” Michaels says. “A study published in the Strength and Conditioning Journal looked at cyclists who ate before they trained versus those who fasted before they trained. The amount of fat burn was the same for both groups, but those who had trained without eating first had 10 percent of their calorie burn come from protein — including their own muscle mass,” according to Michaels’ website. Bananas are packed with fiber, potassium, vitamin C and B6. One serving of peanut butter has 3 milligrams of the powerful antioxidant vitamin E, bone-building magnesium, muscle-friendly potassium and more of the immunity-boosting vitamin B6, according to health site, prevention.com. That’s all-around great nutrients to have in your system, pre- or post- workout. This recipe I put together myself, it’s simple and sweet! 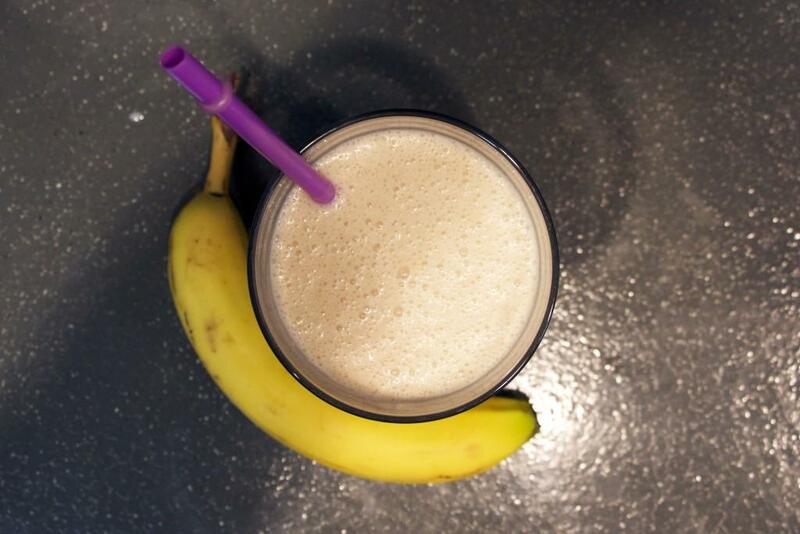 Using a blender, combine banana, peanut butter, milk, honey and cinnamon. If you want a little more sweetness, put a dash of cinnamon on top. Also, if you are into protein smoothies, you can use EAS Soy Protein Powder. You can find it at Target or Wal-Mart stores. Use ice cubes to get a thick smoothie. Now you’re set to start your exercise routine out right!